The course is built on an almost flat land to challenge advanced players. The course features some spectacular lake carries, and great bunkering. The front 9 holes have parkland atmosphere free of H2O except for the 1st & 8th hole. However, there are plenty of trees and bunkers to gobble up errant shots. One the other hand, big lakes account for large share of the landscape, just as the name implies. Each hole is challenging and strategic finesse is required on the back 9. The water comes into play on 8 holes except for the 18th hole. There are many picturesque holes like 11th, 14th, 16th and 17th holes where you can enjoy beautiful contrast among the lakes, the greens and the fairways. It is famous for often hosting major tournaments in Australia. The gusty see wind, if strong, will add greatly to the degree of the difficulty. The course is well-known for its’ usage of water hazards, and other characteristics such as multi-bunkers, and narrow fairways tightly guarded by ponds. The 14th is a famous water-carry par 5. A beautiful, straight hole with a big lake on the left. If you shy away from the left and hit too much to the right, your ball will wonder off into a sand dune. The small green slopes slightly from back to front. A long par 4 that doglegs to the right. Bunkers positioned on both sides of the fairway are in play off the tee. Also I need to remind you that the fairway is narrow. You should hit a long drive onto the left side of the tight fairway in order to aim the green more easily on the second shot. A slight dogleg to the left, a short par 4. It is safe to hit the tee shot down to the right-center with a fairway wood or a long iron, keeping the tee shot short of bunkers and mounds. A straight hole with a magnificent downhill tee shot. A long hitter need to watch out for a small pond on the right. The tee shot is relatively generous though it narrows closer to the green. The set up requires an accurate second shot. Fairway bunkers across the hole come into play. A challenging hole that doglegs slightly to the left. The tee shot is intimidating as the fairway is very narrow and guarded by trees on the right and swampland on the left. The second shot hitting onto a large, although semi- blind, green isn’t difficult as long as you pay attention to a pot bunker in the front. Make sure you don’t hit over the green as well. A beautiful dogleg to the right shaped like a boomerang, curing around a big lake. The third shot is over the water and bunkers around the green come into play as well. The green slopes from back to front and is very fast, so you had better place an approach shot in front of the pin. Leading pros try to hit the green in 2 on this long par 5 with around 250 yard second shots. This hole has been selected as one of the best 500 holes in the world in the year of 2000 by US Golf Magazine. A downhill, sharp dogleg to the right. It’s a short par 4. There is a small pond on the right corner and bush on the left, so it’s safe to hit onto the left of the pond with a fairway wood or a long iron off the tee. The fairway slopes sharply from left to right. The green also slopes steeply from left to right with a ridge in the middle, so puts and approaches from the back are difficult. An ultra long hitter can try to hit over trees in front of the green onto the green in 1 shot and Sergio Garcia made it successfully in a tournament in 2003. A signature hole. It is a straight hole until the landing area of the second shot. Then the green is swung to the left, the opposite side of a big lake, requiring full water carry on the third shot. This hole is beautiful, too. When the wind is behind you, you must make a decision to either take a risk ands go for the green in 2 or hit the green in 3 safely. This hole becomes a very challenging par 4 on pro tournament by using a forwarded tee. A very famous pro hit the lake 3 times and ended up with 11. A long par 4 that doglegs to the right. The second shot is over a lake. The green slopes from right to left. A view of the green and the lake is excellent. A straight par 5 requiring double water carry. Very reachable in 2 for a long hitter. 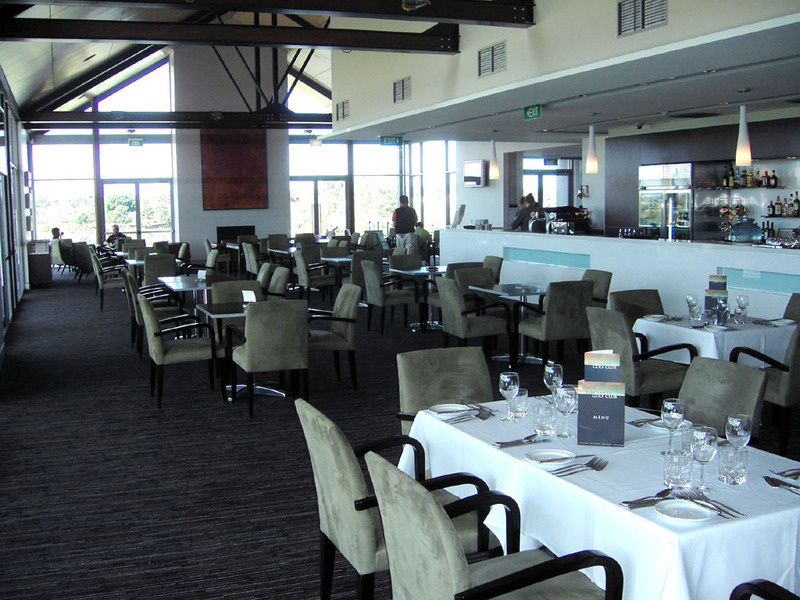 It is a 25 minute drive from Central Sydney and a 10 minute drive from airport. Visitors can play for certain days on weekdays and must be accompanied by a member on weekends. The distances are in meters. Jacuzzi & sauna are available. A highway was open in the course in early 1970 and as the result 3 holes in the front 9 was amended from the original design. 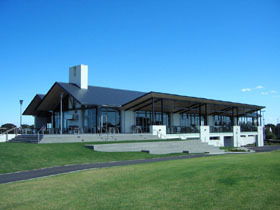 The course is ranked 16th in Australia by Golf Digest 2004.